Tasmania’s plan to become Australia’s renewable energy powerhouse is one step closer, with an initial study finding 14 new pumped hydro sites that could deliver a potential 4800MW of new capacity. 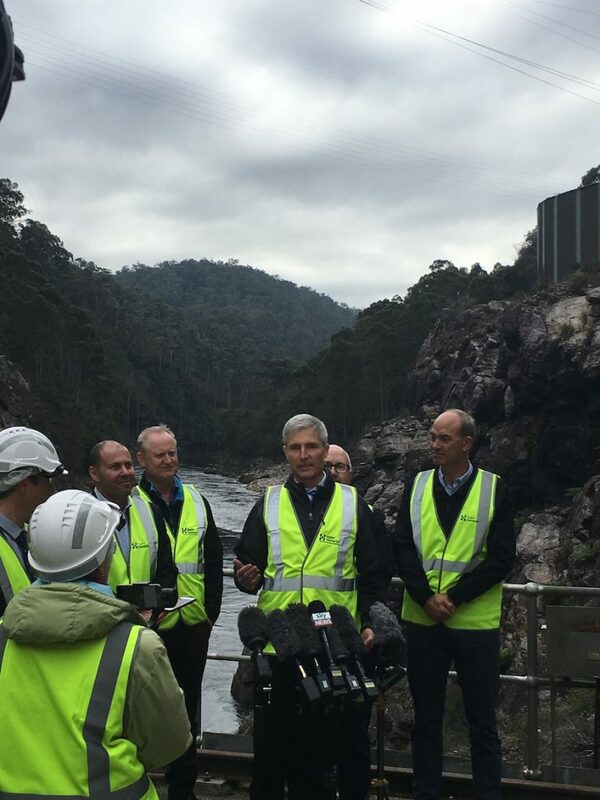 This is the latest step in a journey that began last year when Prime Minister Malcolm Turnbull and Tasmanian Premier Will Hodgman announced a plan to power 500,000 homes with Tasmania’s hydro electricity. The scoping of new pumped hydro locations is the second phase of investigations as part of Tasmania’s plan to become the ‘Battery of the Nation’. Last year, ARENA provided $2.5 million in funding to Hydro Tasmania to investigate whether it would be feasible to expand or augment two existing hydro power stations at Tarraleah and Gordon and build new pumped hydro plants to double the state’s electricity generation. The funding also sought to examine whether Tasmania could play an expanded role as an exporter of electricity to the mainland National Electricity Market. Initial results are now in and today federal Minister Josh Frydenberg and the Tasmanian Government announced that 14 suitable locations have been found with an estimated total potential capacity of 4800MW and 140,000MWh of storage. The shortlisted locations are clustered around eight existing reservoirs in the central highlands, north and west coasts. These preferred 14 sites will now be refined further to find the best locations to achieve the project’s 2500MW target. Hydro-electric power stations have powered Tasmania for 100 years, currently supplying more than 80 per cent of the state’s electricity requirements. Building more capacity to export to mainland states would be dependent upon construction of a second interconnector. Separate to the Battery of the Nation, ARENA has also committed $10 million in funding towards a business case for a second interconnector which is being developed, and jointly funded, by Tasmania’s energy network TasNetwork. Pumped hydro functions much like traditional hydro electricity, but reuses water over and over again. It works by pumping water to higher reservoirs when energy is in low demand and cheap, or there is an excess of solar or wind power. Water is released to power a turbine when demand peaks or renewable generators aren’t making electricity. Storage is unlocking the potential of low cost generators, reducing fluctuations in supply by banking the power of the sun and wind. 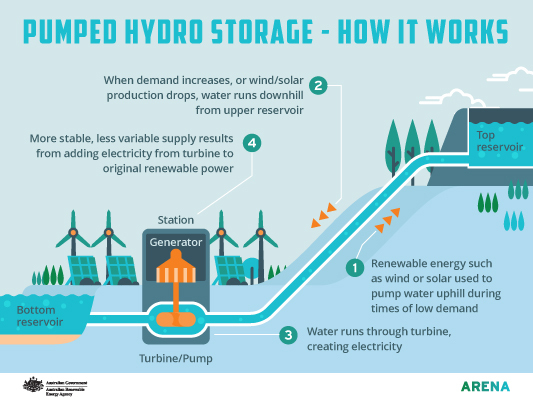 This is growing demand for grid-scale storage as more renewables come online, given pumped hydro can store energy for longer than any other available technology. Hydro Tasmania’s early modelling shows the Battery of the Nation project could deliver $5 billion of investment and up to 3,000 jobs over the next 10 to 15 years. ARENA CEO Ivor Frischknecht said the initial concept study for new pumped hydro reinforces Tasmania’s potential to provide large-scale storage for the mainland. “Tasmania has been identified as the Battery of the Nation for a reason, as it has some of the best wind resources and existing hydro-electric power,” Mr Frischknecht said. The capital cost of the potential projects is estimated to be between $1.1 – $2.3 million per MW, but most sites will come in below $1.5 million per megawatt. Hydro Tasmania CEO Steve Davy said the study confirms there’s comfortably more than 2,500 megawatts of reliable and cost-effective pumped hydro potential in Tasmania. “Battery of the Nation is about locking in our island’s energy security and giving Tasmania’s the lowest possible power prices. It offers a future that’s clean, reliable and affordable,” he said. Want to know more? Read the full report. Will pumped hydro unlock the transition to renewables?